SPILL KITS combine the best absorbents, clothing and equipment to respond to the type of spill that you want to prepare for. Being prepared for a spill before it happens will reduce the time, manpower and overall costs of the spill cleanup. Choose the spill kit that best fits your needs and fill it with quality absorbents and safety supplies found on this web site. ZIPPER BAG SPILL KITS are ideal for grab and go situations. In planning for a chemical or oil spill, the spill kit should be located where the spill will most likely occur. When a spill happens in another location, first responders can get to it quickly with the zipper bag spill kit because it so light weight. The zipper bag spill kit is also used in trucks and other vehicles, where it can be stuffed behind seats or in other small areas. Various prepackaged spill kits are available. Universal spill kits will pick up oil and water-based chemicals. Oil-only spill kits will absorb petroleum products but will not absorb water, Kit 4U allows you to tell us what you need in your spill kits. Our Two Wheel Spill Carts are designed for larger spills but with the same quick response time as the zipper bag spill kits. Spill cart sizes sizes available are 48 gal, 64 gal and 98 gal. Contents of the spill carts can also be customized to your specific needs. Our Overpack Drums and Lab Pack Spill Kits are are constructed of chemical resistant, high density, polyethylene. They are lightweight, nestable, and include UV inhibitors, making them ideal for outdoor use . Screw lids allow easy access to the spill kit contents. In addition to a durable storage cantainer for absorbents and safety equipment for spill response, the D.O.T. 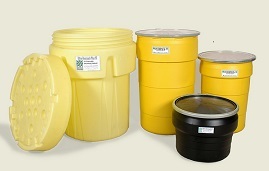 approved overpack drums can be used to transport saturated absorbents and leaking drums. 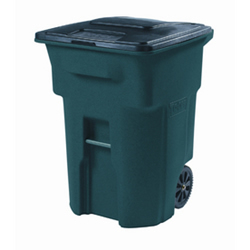 The 95 gallon overpack drum will hold drums sizes up to 55 gallons. The 65 gallon overpack drums will hold drums sizes up to 30 gallons.